Pamela Lu, Ambient Parking Lot, Kenning Editions, 2011. "Part fiction, part earnest mockumentary, AMBIENT PARKING LOT follows a band of musicians as they wander the parking structures of urban downtown and greater suburbia in quest of the ultimate ambient noise—one that promises to embody their historical moment and deliver them up to the heights of their self-important artistry. Along the way, they make sporadic forays into lyric while contending with doubts, delusions, miscalculations, mutinies, and minor triumphs. This saga peers into the wreckage of a post-9/11 landscape and embraces the comedy and poignancy of failed utopia." "Ambient Parking Lot is a 187-page book about one band’s quest to capture the world’s most perfect ambient noise in a parking lot. Wait, don’t go away! It's great ... I swear. Author Pamela Lu’s novel follows the Ambient Parkers, a fictional collective of musicians and artists, as they rise to heights of fame or alternately cower under the weight of their shortcomings. Their peaks and valleys shape a familiar refrain if you’ve ever been in a band; Lu uses the Ambient Parkers (they are otherwise anonymous) as a foil by which she is able to draw the whole business of the so-called underground art establishment under her perceptive and witty lens. The performance artist who joins the Ambient Parkers for a night of experimental dance, the respected radio DJ who rebukes their creative advances, and perhaps most impressively of all, us, the fickle and demanding public: these are just a handful of the cogs in a not-at-all-well-oiled (and certainly well worn) machine. In short, Ambient Parking Lot is Lu’s love song to the independent artist and the scene that he or she is a part of. He has no patron, no propulsion other than a curious drive to produce, to create. He is filled with doubt, wracked by neurotic compulsion. Grand success eludes him, but small victories are hard fought and well earned. Financial stability is not a goal but a hurdle, nagging at him from the periphery. He is the suburban anti-hero of the 2000s, driven but erratically so. Basking in the afternoon sun between empty factories and foreclosed homes, he has learned to love his blighted environment and revel in its hidden beauty. And so, for all the humor in Ambient Parking Lot, for the subtle mocking jabs at the artists’ egos, there is an equally strong current of admiration. The Ambient Parkers are sincere, almost naively so, unwilling to "play the game" ... but willing to try it out. They are somehow self-important and self-deprecating at the same time. They are every independent band as they confront the specter of commercial and critical success, as they grapple with their image and then grapple with consciously grappling with their image. It’s dizzying, really, and hilarious. 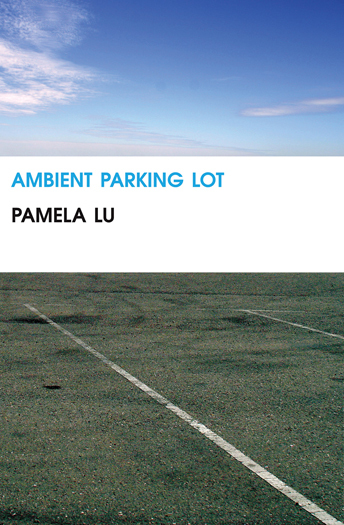 "Pamela Lu’s Ambient Parking Lot, described on the book’s back cover as “part fiction, part earnest mockumentary,” details the career of a group of musicians dedicated to recording and performing the ambient noise found in parking lots and structures, a group who “championed authentic experience and plunged headlong into the romance of the overlooked space” (Lu 32). The novel, largely told from the first-person plural point-of-view of the band, is a smart and lyrical document of an imagined avant-garde, a sort of Spinal Tap for conceptual music fans. While the novel is, as its back cover claims, earnest, it’s also hilarious and oddly touching given the absurdity of the band’s recording and performance of parking lots, a music that “emitted a low earthly growl, privileging bass-level amplitude over quais-narrative pop disappointment” (Lu 3). The story of the band’s rise and fall is reminiscent of an episode of a better, more interesting version of “Behind the Music,” one that meditates on the creation of art, the struggle to balance commercial success with artistic integrity, and the pressure to innovate (rather than stereotypical rock-and-roll detritus). Ambient Parking Lot is more than a manifesto for a fictional band, but is also an exploration of the Ambient Parkers’ struggles and successes. At times I felt like I was on the verge of being bogged down by the novel’s conceit, that I couldn’t possibly be interested in reading anything more about the Ambient Parkers, but Lu’s consistent wit, insight, and ability to transform concept into a compelling narrative prevent this from happening. It’s easy to laugh at the Ambient Parkers—there are plenty of moments in the narrative that are self-conscious enough that the reader knows he or she is laughing along with somebody, but one of the remarkable things about this book is how, despite the absurdity of the Parkers’ project, and despite the earnest enthusiasm of the band's members, it’s easy to feel for them, but it’s also easy to be convinced that the art the book describes—the sounds of urban parking structures—is important. The novel strikes the perfect balance between earnest and mock, and though the Parkers' project may be absurd, the novel’s smart enough to create an intelligent, enlightening dialogue around the Parkers’ conceptual music. My friend Judy Nylon visited me and brought me a record of 18th century harp music. After she had gone, and with some considerable difficulty, I put on the record. Having laid down, I realized that the amplifier was set at an extremely low level, and that one channel of the stereo had failed completely. Since I hadn’t the energy to get up and improve matters, the record played on almost inaudibly. This presented what was for me a new way of hearing music—as part of the ambience of the environment just as the color of the light and the sound of the rain were parts of that ambience. Thus Eno recounts how he came to invent “ambient” music (he also coined the name). Ambient music did, of course, have a classical music forerunner in the musique d’ameublement (literally, “furniture music”) of Satie—small tinkling sketches meant to decorate a room — but Eno introduced that minimalism into the context of rock. This would prove profoundly influential as, to give just one example, ambient music would affect a shift from the songs-as-pieces-of-the-album’s-larger-whole format that most listeners were familiar with. Instead of emphasizing the song, or even the album, ambient music emphasizes the experience of music, the feeling of music, the listening. Today, ambient music is everywhere, from art galleries to banner ads on the home page of the Wall Street Journal. While this turn has largely been looked at positively, especially in light of its use in the decoration of public spaces (and, really, who can object to a new form of art? ), what if we were to suspend the music in its genesis, and examine it there? What does ambient music — as music of Eno’s enforced, cerebral solitude — look like? Asked differently, how much time can we spend by ourselves in our rooms? “Actually, I’d grown somewhat dissatisfied with my role in that community,” says an unnamed Dancer in the penultimate chapter—which takes the form of a Terry Gross style interview—of Pamela Lu’s Ambient Parking Lot. The Dancer is discussing her involvement with her local art scene as a preamble to her artistic rebirth—her first meeting with the hilariously named band, The Ambient Parkers. The Ambient Parkers are the main characters of Lu’s book—an ambient music band that makes a career of recording the parking lots of different American cities. The book follows the band’s early stumblings and breakthroughs in content and performance as well as its concerns over money and career direction. The band (and the book) gets sidetracked by a long critique from a station manager at a pirate radio station until, finally, they’re accepted by the pop music community. We slipped underground and regrouped to discuss proper ambition. After several cycles of soul-searching, we deemed ourselves ready to produce a full length album. We purchased sturdy walking shoes and took only public transit in order to develop rigorous objectivity vis-à-vis our subject matter. Lu excels at this type of aesthetic language, and the book hangs on the simultaneously earnest and absurd progression of the Ambient Parkers through different descriptions of their acts while they continue to simply make ambient recordings of parking lots. Lu uses this story as scaffolding upon which to layer analyses of listening, creation, etc. Her book is never a satire. Her characters engage in the sincere attempt to escape the passive acceptance of their inherited surroundings. Eno couldn’t get up from his bed to change the volume; how can Lu’s musicians both faithfully record and positively affect their surroundings? How can we respect the parking lots (and strip malls and old highways and dilapidated city centers and…and…) while transforming them into something different? Her solitude was consummate and philosophic, that of a lone survivor in a parking lot marked for death. As she punched in the numbers, the space between her fingers, the phone, and the wreckage was filled in with ambience, a covert backdrop of collective amnesia and white noise impeding her efforts to secure voice contact with a savior. The Dancer’s movement furthers the Parkers’ inquiry into their environment but shifts the activity from the collective to the individual through the polite schism her language makes with that of the Parkers. This is one way Lu’s book looks at the cerebral struggle of artmaking and of ambient music: as struggle between the problems of the language of individual and the language of the collective. What to do with the parking lots flips into what to do with the disaster victim? How can we transform the highways becomes how can we give automobile drivers a secure voice? “The room was grey, the carpet was grey, the light was grey,” Nylon remembered. It was pouring rain. Nylon bought a tape of harp music for [Eno] from a street vendor. She wasn’t much into harp music—Eno wasn’t a particular fan either—but she thought, based on her own childhood experiences, that the mellifluous instrumentals might help. She put it on the stereo at a low volume and tried to balance it with the sound of the rain. Eno caught on to what she was doing, and leaned over, helping to balance the soft music with the sound of the pitter-patter of the raindrops. Eno’s fabled ambient-music wasn’t an accidental mistake; it naturally flowed from the setting. "Parked in a corner of Pamela Lu’s Ambient Parking Lot, I turned up the volume on my headphones and listened long past the comfort level of both my bladder and my thirst, testing the limits of the quickly fading sunlight. I chuckled and tick-marked at record speed, drunk with the spot-on parody and ridiculous brilliance of her lines. What I love about Lu’s work is her sharp wit, subtle delivery and deadpan hilarity, which you have to slow down and listen for in order to fully appreciate. Thus, parked, I listened. Lu’s characters, all of them, are also listening. This book is a mock-documentary novel that tracks the mid-highs and mid-lows of a band of ambient noise musicians, the Ambient Parkers, who record in parking lots and garages and sample car trunk thuds, gridlock traffic honks, revving engines and the like. Aspiring to capture the nature in the machine, their material is capitalism and its doomed, sublime ambience. Reading this book is like watching an indie webisode spin-off of “Behind the Music” (“Behind the Noise”) run by a group of nerdy, over-enthusiastic volunteers and bored unpaid interns with MFA degrees. Lu tracks the Ambient Parkers’ absolute mediocrity in awkwardly-awesome crescendos and geeky-fantastic loops. Parts of it read like an overly self-conscious, overly detailed fan blog with absolutely no web traffic, which is crafted with earnest, superb engineering and is as addictive as low-calorie reality TV. The band’s fits of self-induced melodrama and cheesy enlightenment register as mere blips and farts to The Alternative Mainstream—yet, anonymously, the band continues, and miraculously, they continue to be heard. This book asks us to listen to the intonations between noise and silence, between constant movement and abrupt stillness, between entropy and paralysis, between the cars and the lot. The Ambient Parkers unknowingly stumble upon these spaces, accidentally bumping into other failures of capitalism, other awkward nerds and excessive outcasts. Together they sip weak tea and theorize in a co-op across the street, grappling with their ridiculous and “unspectacular existence[s].” Their refusals—their starts, deletions and restarts—fall like bulldozed trees in a future parking lot, which splinter and crack underneath the bureaucratic electric saw of free-market time. Their attempts beg the question: What does it mean to fail, as J. Halberstam asks in The Queer Art of Failure, if the hegemonic rubric of success is pre-designed? Lu brings a boom mic up to the excessive amounts of noise that capitalism constructs and demands be meticulously maintained, from the white noise of gentrification to the mobile phone radiation of global communication systems to the pretentious hype of green trends and the academic elite. If we are often complacent and complicit in these structures, Lu plays back the thrilling complexity of their inaudible sounds and gestures so that we can no longer ignore them. The Ambient Parkers sample and record our sense of worthlessness, insignificance, loneliness and sheer absurdity as artists “superfluous to the discourse” and paralyzed by excess. The “always on” or “always on vibrate” cultural standard means that silence is not something we’re trained to hear. To train our ears, Lu builds the Ambient Parkers’ profile from a variety of source materials—first in their own manifesto and then in the manifesto of a rival copycat band, the Ambient Barkers. This is followed by “The Salaryman Chronicles,” a hilariously detailed report compiled by a private investigator that documents the bored and empty minutes of a band member who has sold himself out to the corporate cubicle world. We stop to listen to extended tracks: a radio interview with a dancer on her previous collaboration with the band (complete with indications for [Pauses], [Shifts in her chair] and [Forty-five seconds of radio announcements]) and a 50-page email from the Station Master of a pirate radio station who they’ve been stalking (including the band’s ridiculous attempts to reply). Caught up in the absurd mechanizations of their lives, the characters in Ambient Parking Lot strive for “a moment of recognition” with silence that is never quite attained or successfully replicated. In their extreme awkwardness, they share an “air of distraction…a restless shifting and quiet shuffling.” They stall; we idle. Our listening stretches out long past what’s comfortable; we listen to them systematically occupy all 116 parking spots in a corporate garage and busk in a park to pathetic results for 21 days. "Two new releases by Chicago-based Kenning Editions take on ambience as a central motif. Pamela Lu’s Ambient Parking Lot documents the various transformations of a fictitious music group that creates demos out of parking lot sounds, while Tan Lin’s Insomnia and the Aunt is touted as an “ambient novel, composed of black and white photographs, postcards, Google reverse searches, letters, appendices, an index to an imaginary novel, re-runs and footnotes.” A long time reader of both authors, I expected to be intrigued—intellectually tickled and incited—by these newest releases. I was surprised by how deeply both texts in fact touched me. The way Lu details the band’s various failures and successes, their persistent efforts at transformation, are by turns hilarious, exhilarating, and deflating. A long chapter written from the perspective of a pirate radio station master, to whom the band obsessively reaches out for recognition, stunned me with its quick changes and emotional breadth. I challenge anyone to not be profoundly moved by that chapter’s conclusion. Lin’s book, with its central themes of family history, death, and repetition winding dizzyingly together like a glossy Chinese finger trap for the intellect, startled me with its elegiac atmosphere: for all its detached accounts of television reruns and mini-treatises on the beauty of lies, I found Insomnia and the Aunt to be a terrifically somber, heartfelt text. Despite their differences, both books suggest how media/corporate influences have replaced the centers of our emotional lives to the extent that self-discovery or transformation are impossible in the absence of/without attending to our ambient preconditions. The characters of these texts, surrounded by the aural and sonic excess of our own collective making, move with a detached engagement—one that allows them to be calmly swept aside. Part of what makes this stance possible for these characters is the apparent lack of a central identity. In this regard, these texts suggest that the digital/industrial/commercial ambience that surrounds us has also infiltrated us. We are truly inseparable from our environments. There are interesting resonances with ecopoetics in these works, but from a surprising vantage point: the logic of the ecology in this case rests upon throughly man-made environments. Ambient Parking Lot ambitiously sets out to explore how one collective seeks to make use of and create sense from our ambient conditions. The novel opens with the group’s radical beginning as a conceptual experiment seeking to draw the vacant beauty and growling reverberations of parking lots to the limelight of public attention through their musical structures. The Ambient Parkers’ various transformations—from hyper-peripheral avant garde-ists to subcultural goth glam divas to darlings of the music industry, a quasi-Radiohead of their day, with academics and cultural pundits deliberating the import of their work—suggest the protean, elusive character of ambience itself. Importantly, they draw their inspiration from cars and parking lots—from fuel-injected propulsion and conspicuous absences. The group’s transformations take on the qualities of their muse; for all their “progress,” they are incapable of ever finding “a” “truth” in their work, and require the introjection of outside, individual perspectives to help them attain insight. Her emphasis on collectivity and action has some resonances with Renee Gladman’s The Activist (Krupskaya), but Lu broaches her project with more humor and a stronger interest in voice. Her two chapters, “The Station Master” and “Death of an Automotive Dancer” are exceptional for being narrated by non-band characters. These two chapters carry the emotional centers of the text, and embody spiritual nadirs and zeniths that the band had been unable to attain for themselves. That such centers are embodied in individual and not collective narrations suggests that true insight or clarity cannot happen within or are occluded from the plural consciousness. However, is plurality or embedded-ness really the cause for the Ambient Parker’s ultimate inability to correctly appraise their own work? In a description of a performance artist’s agonizing dance in response to 9/11, ambience emerges as a “covert backdrop of collective amnesia and white noise impeding her efforts to secure voice contact with a savior” (23). If our preconditions are ambient—escaping notice, inspiring forgetfulness and distraction—then it stands to reason that our consciousness might be ambient as well. It makes sense, then, that Lu would defer to the first person plural as a mode of narration. The novel centers around the band’s collective consciousness with specific numbers of its members continually in flux and undefined: “As individuals, they could have gone unnoticed [...] but standing next to one another, they somehow came together as a group, amassing an identity that you couldn’t ignore or deny. [...] What they shared most was an air of distraction, a sense of foreboding that came through in their restless shifting and quiet shuffling” (143). At various moments, people drop out and leave, but the band has a replenishable core that labors to continue its work. And that work also defines them-—aside from the admittedly fuzzy collective nature of the group, they are rooted in their ceaseless desire for recognition—though for what, precisely, is never perfectly articulated. For the most part, their yen for recognition seems to be a residual effect of their desire to create something that matters, but what their message or the content of that matter might be is always skirted over or slides into something new. In this way, Lu captures—and mocks as well, perhaps, but lovingly—the existential pretenses of artistic endeavors. In the end, Lu suggests that despite the absurdities and shifting metamorphoses inherent in human effort, the greatest grace and sense of humanity comes from attending, from recognizing that the deathly silence we fear is in fact fully populated and alive once we quiet ourselves. By the novel’s end, ambience takes on new meaning, and doesn’t require our torturously theorized amplifications but graces us when we quietly acknowledge it. Pamela Lu, Pamela: A Novel, Atelos, 1998..
"Pamela Lu's Pamela: A Novel rocks. Lu manages to explore, critique, and worry about identity, location, self-expression, communication, shopping malls, orange dresses, and the future with glorious intelligence and laugh-out-loud humor, in the context of exquisitely wrought and very long sentences. One suspects that, like the character YJ, Lu "was always living and writing against a blind wall of cacophony that existed somewhere between plain sense and the din of cultural expectation and popular music." The narrator P (as well as her twenty-something friends L, R, YJ, C, A, and so on) thus occupies "the contemporary position of always being foreign to herself, a private predicament which necessarily played itself out on the public level, in the politics of making a literature that struggled to catch sight of itself, as if that could provide some assurance of its existence. We were using a borrowed language to add more words to our names . . ." Where do we draw the line between fiction and autobiography? Frankly, when reading Pamela, we could care less. The truth of this writing is in its extreme excellence: we need no more." "Pamela: A Novel is one of the finest books to emerge from the ardent, experimental writing scene in the Bay Area. Pamela marries the ability to generalize with the endless unrolling of the self as it readjusts to its own failure to exist. Lu tracks the doings of L, R, C, A, and the narrator, I, as they look at a mall, eat at a Malaysian restaurant on Clement Street, or go for a walk. L, R, C, A, and I are instances of themselves, functions, mispronounced words. Lu conveys the boundless artificiality of their experience and the particular nausea of imploding infrastructures in a pastiche of 18th-century style whose artifice is never broken and whose solemn periods are as measured as a Handel march. I prefer to think of Lu's sentences as Ciceronian and to read Pamela as classical revival in the tradition of the early modernists like Isadora and Nijinsky. Here are the generally held truths, what oft was thought, expressed in old new sentences ringing with collective confidence. Lu's generally held tenets call for a disbelief so extreme they are reduced to faith. These truths, ne'er so well expressed, are emitted by We, a glorious pronoun in which Lu builds a social space and founds a society. Like any court society, the function of each member is to be a little different from the others in order to create fascinating permutations of like and unlike. Pamela could be a collaboration of Madame de La Fayette and Maurice Blanchot, but "the community of doubt" looks like a Rotary Club next to L, R, C, A, and I! "According to its mission statement, Atelos publishes "under the sign of poetry" works that are "involved in some way with crossing traditional genre boundaries." But there's nothing in Pamela: A Novel that signals any kind of generic instability or discomfort; if we sense any, it's only because the publisher urges us to look for it. This may be the intended function of the publisher's name: either to alert you to the subterranean presence of "signs of poetry" that you wouldn't otherwise see, or else to create signs of poetry that aren't really there. This is a novel that looks and feels like a novel, and it even calls itself a novel. Its title, in fact, is something that it shares with Samuel Richardson's Pamela, which is often called the first novel in English. But that may be the only thing it shares with Richardson's Pamela. If we have reached a point in literary history at which both Pamela, or Virtue Rewarded and Pamela: A Novel are unproblematically recognizable as novels, is it still possible to distinguish between something that is a novel and something that isn't? The short answer to this question is "no": the novel as a genre includes such various examples that we can't say that it has any identifying characteristics--which is why both Jane Austen and Gertrude Stein say that the novel is simply "everything." So I'm tempted to argue that the only possible connection between the two Pamelas must be a subterranean one. On the surface, the two books appear to have nothing in common. Richardson's is a domestic drama enacted mainly in scenes with only two or three characters; Lu's is a portrait of a much larger community and is presented almost exclusively in a summary mode, even when it's dealing with specific actions and events. Richardson wants to bring you as close as possible to the scenes in his novel, even to collapse diegetic action together with acts of writing and reading into a single moment; Lu works very hard to distance herself from any moments of intimacy by refracting them through memory, retelling, contemplation, and various technologies of representation. (Lu's novel takes place almost entirely in conversations, but none of the conversations is represented directly; what you get are reported conversations.) You could even say that the title asserts a connection between the two novels only as a way of confirming that there is no connection, or as a way of saying that we have reached a point in literary history where the original Pamela no longer means anything to us. Nonetheless, the two novels do share modes of processing information, notably in the way they deal with proper names. "Pamela" is one of the few full names given in Richardson's novel; many of the others (like that of her employer/husband, "Mr. B.") are reduced to their incipit letters, apparently in an effort to protect the identity of the characters who bear them. "Pamela" is pretty much the only full name given in Lu's novel (although there's also a cat called "Kit-Ten"), and it's introduced in a way that calls into question the possibility of its usefulness to any person. Otherwise, the names of the characters are reduced to letters, either to protect their identities (or to suggest that there are identities that need protection) or to suggest their resemblance to variables in mathematical expressions. Lu then pushes this effect ever further by commenting on it: "We sometimes wondered who this 'I' really was. . . . 'I' (which expanded during times of war or crisis to 'we') was the most ubiquitous, and therefore elusive, self we could imagine: there was no way to find 'I' without by definition losing it, and therefore losing ourselves." Rejecting "I" because it represents another voice speaking through you, rejecting "we" because of its tendency to absorb whatever it's addressing, finally rejecting the possibility of speaking personally or communally in an inherited language, this passage seems to assume that language is a kind of property, and that it belongs to some speakers more than to others. But at the same time, it serves as a reminder that the basic materials of language don't belong to anyone. "I," a personal pronoun, the word we use to designate ourselves, the word we identify with at the most profound level, accommodates more than one person. So if one implication of this novel is that "I" and "we," like the name "Pamela," are always fictions (or even specifically novelistic effects), another implication is that a word like "I" can never be a fiction. Reading the word "I" in this novel becomes a mystical experience--an invitation to connect to the "I" in all of us. There even seems to be some attempt here, in all the effort to create distance, to arrive at a point so distant that there's no particularity at all, so that the designations in the novel could apply equally well to anyone. For the most part, Lu writes a prose without accent, inflection, idiom, personal style, local color, or historical specificity (although at times it's faintly archaic)--in short, a prose that isn't based in speech. As we have seen, it defaults on any attempt to represent speech directly, and at one point registers surprise at the possibility that speech could be represented in writing: ". . . a web page containing many of R's quotations from college, a find that amused me and astonished R, since R had never, to her knowledge, recorded her spoken statements, much less posted them on the Internet for all to see." This language that no one speaks is something more than the non-style of the late twentieth century, the style that doesn't see itself as a style; Lu is writing in the unjustly disparaged dialect of English called "translationese," the language of literary translation. This novel reads like a translation; you often get the feeling that there is another text behind the novel you're reading, that Lu is trying to accommodate the effects of one language using the materials of another (and sometimes that's exactly what she says she's doing). This style has had other practitioners in recent fiction, most significantly Lydia Davis, whose work amply demonstrates that you don't have to have a feeling for spoken language in order to have a feeling for language. (Davis's work is also remarkable for its deployment of the first-person plural; she is also the main translator of Blanchot's novels, in which the names of the characters tend to be reduced to their incipit letters, into English.) Like Davis, Lu doesn't like to furnish unnecessary details or to name names; she eschews the techniques of verisimilitude, the minute operations that novelists have traditionally deemed necessary to create a world that the reader can imagine inhabiting. Unlike Davis, however, Lu allows for certain forms of specificity to enter her vocabulary. She can use place-names (countries, cities, institutions, even specific buildings); she can write about popular culture (which isn't exactly a form of specificity, but never mind); and she can use the word "Internet" (maybe Davis can too, but so far she hasn't). There's also a note of archaism in Lu's sentences, at least on the level of syntax. Partly this is a result of reading Lu alongside her 18th-century predecessor, but her sentences, which are controlled, stately, and vigorous, are closer to Henry Fielding's than to Richardson's, which are breathless and exclamatory. You could almost say that Lu is rewriting both Richardson's novel and Fielding's parodic versions Shamela and Joseph Andrews: here, the false and true Pamelas converge; Shamela is Pamela.